How can we leverage Scala Streams to manage very large data sets with limited computing resources? A Stream instance can be regarded as lazy list, or more accurately a list with lazy elements. The elements are allocated only when accessed. Stream allows Scala developers to write infinite sequences. Elements can be removed from memory (to be handled by the GC)defined) by eliminating any reference to its elements once no longer needed. 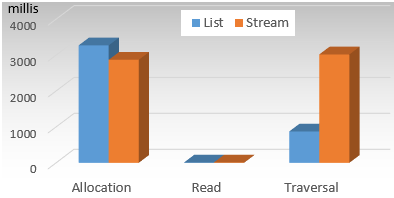 It is easy to understand the benefit of Stream in term of memory management. But what about the performance? Let's start by defining these operations in the context of computing the mean value of a very large sequence of double values. Let's implement the same sequence of operations using Stream class. The implementation of the generation of random values using Stream is very similar to the implementation using List (line 4, 5). The mean of the stream is also computed with a reducer (line 8). The test is run 20 times to avoid distortion of the initialization of the JVM. The allocation of the elements in the stream is slightly faster than the creation of the list. The main difference is the time required by the List and Stream to traverse the entire collection using the reduceRight method as a reducer. In this code snippet above, the Stream has to allocate all its elements at once. This scenario is very unlikely as Streams are usually needed to process section or slices of a very large sequence of values or objects, as demonstrated in the next section. 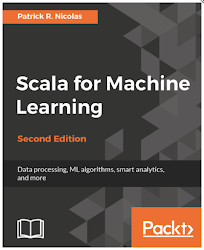 The most common application of Scala Stream is iterative or recursive application of a function/transform or sequence of functions to a very large data set, in this case, the mean value. First, the code creates a reference strm of a stream of NUM random values (line 1). Then it computes the sum of the first STEP elements of the stream (line 4). Once the sum is computed, these elements are dropped from the stream (line 5). The mean value is updated for each new batch of new STEP elements (line 9-11). Here is an alternative implementation of the computation of the moving average on a stream of floating point values using the tail recursion. The recursive call average (line 4) has two arguments: the stream src traversed through the recursion (line 5), and the stream that collects the average (mean) values (line 6). The method recurses as long as the source stream src is not empty (line 8).